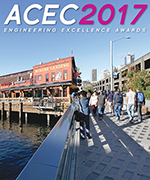 Magnusson Klemencic Associates won ACEC Washington’s platinum award for its role as the public realm lead in the Elliott Bay Seawall project in Seattle. 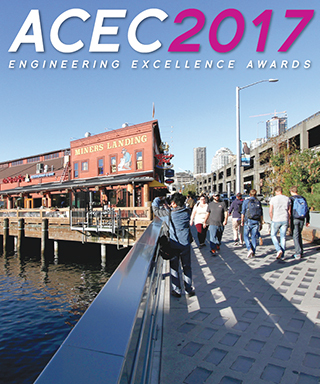 Magnusson Klemencic Associates received the platinum award at the 50th annual Engineering Excellence Awards for their design and project leadership of the Elliott Bay Seawall habitat and public space. The awards are sponsored by the Washington state chapter of the American Council of Engineering Companies. This year, ACEC Washington honored 42 projects representing a wide range of engineering achievements and demonstrating the highest degree of skill and ingenuity. The top seven awards — one platinum and six gold — will go on to compete in the ACEC national competition in Washington, D.C., in April. Entries were evaluated by a five-judge panel. The members were Rich Reis, engineer and consultant; Jeff Carpenter, state design engineer at the Washington State Department of Transportation; Steve Johnston, retired engineer; Bob Axley, retired engineer; and Benjamin Minnick, construction editor at the Daily Journal of Commerce.